Scion tC cabin air filter location. This tutorial is for model from year 2005, 2006, 2007, 2008, 2009, 2010, 2011, 2012, 2013, and 2014. 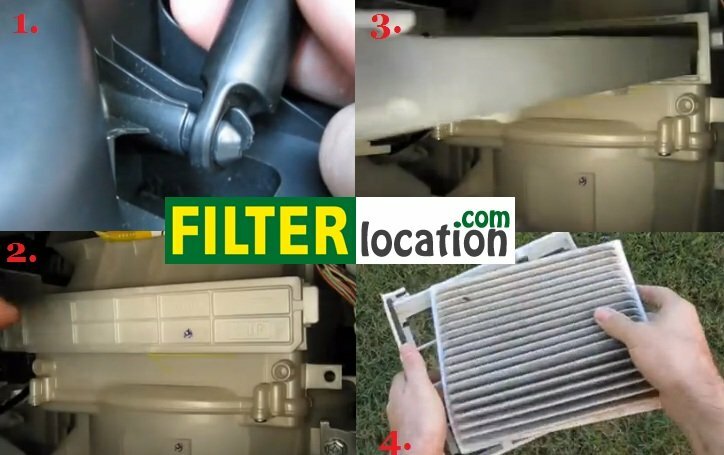 In this tutorial you find step by step where is located and how to change Scion TC cabin filter by yourself. Where is located Scion TC cabin air filter? Maintenance of a car differ from a vehicle to another. If your car service is approaches, below you can see how to change air conditioning filter. To change 2005-2014 Scion TC cabin air filter follow the next instruction. Look one the passenger side and open glove compartment. Release the secure arm from the glove box. Push in on left and right sides of glove compartment to release glove compartment and allow the glove box to hang out. Here you can locate Scion tC cabin air filter housing like in picture bellow. Remove the filter frame by pulling straight out from the housing. Remove the old cabin air filter from the frame and replace with the new Scion tC cabin ait filter. Reinstall filter frame with the new cabin filter back to the cabin filter housing. Reassemble glovebox compartment back in place. Pictures can be different from one car to another but the procedure is the same. Why is necessary to replace the cabin air filter? The pollen filter is designed to remove much of the dust, pollen, pollutants and bacteria penetrate into the interior, protecting the health of passengers and in particular children. In general, it is advisable to change cabin filter every 10.000 miles and especially spring due to accumulations of dirt and moisture in autumn / winter. Besides the health aspect also contributes to the comfort and driver visibility filters were used as effects, odor and misting particularly humid days. Source: Service owner manual, google and other forums.